For seventeen-year-old Ellie Engebretsen, the 2011 decision to include women’s ski jumping in the Olympics is a game changer. She’d love to bring home the gold for her father, a former Olympic hopeful whose dreams were blown along with his kneeson an ill-timed landing. But can she defy the pull of gravity that draws her to Kate Moreau, her biggest competition and the girl of her dreams? 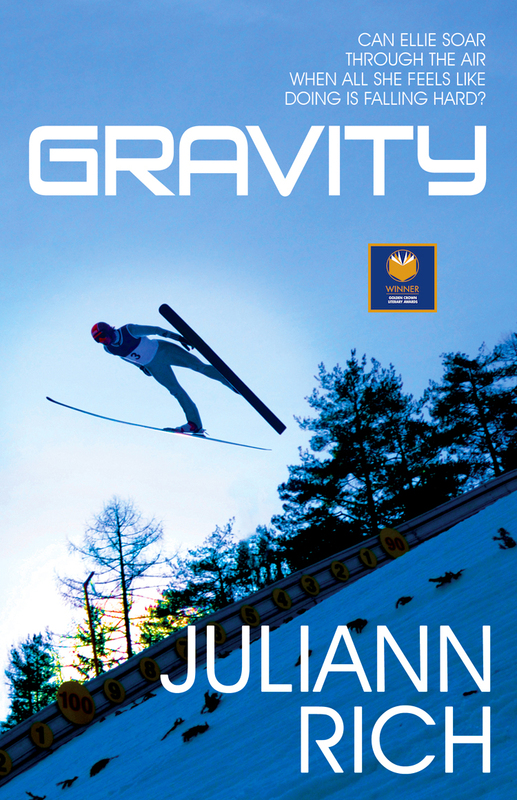 Here’s video of Sarah Hendrickson, Olympic Ski Jumper and member of the US Women’s Ski Team, greeting my guests at the Launch Party for GRAVITY! If I’ve heard Dad preach it once to the Lab Rats, I’ve heard him say it a million times. Take off like you’re ending a bad relationship. Step 1: Don’t create unnecessary friction. In other words, don’t let the skis brush the side of the tracks during the inrun. It’s a stupid way to lose speed. Step 2: Break up. Don’t be broken up with. Wait too long and a jumper can find herself trying to launch off nothing but thin air. Take off while there’s still something solid under your feet. Seems like that’s one bit of advice I should have taken from Dad. Step 3: Lean into your death.